Mast Hoops Traditional mast hoops are made in our workshop from best quality English ash and finished with two coats of linseed oil. They can be supplied either with copper rivets or bolted for fitting to standing masts. 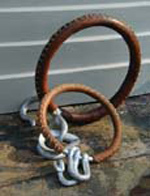 Mast hoops can also be supplied leathered. 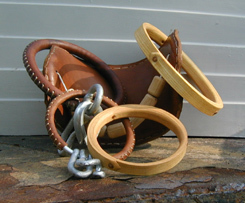 Deadeyes and bullseyes made from lignum vitae or other suitable woods, strapped to your requirements. Ash parrel beads are also made on-site. Leathering of bowsprit travellers (bowsprit rings), gaff saddles and mast hoops is carried out in our workshop. We can also supply leather in whole hides or as required. We make and supply gaff saddles, goosenecks, shackles, bowsprit travellers and all types of deck & mast fittings to your specifications. Our “off-the-shelf” mast hoops can be supplied in the following (internal) diameters: 4”, 5”, 6”, 7”, 8”, 9”, 10”, 12”, 14”, 16”, 18”. Special sizes can be made to order. Wooden Parrel Beads, Deadeyes, Bullseyes. Bowsprit Traveller (Bowsprit Ring), Leathered Gaff Saddle, Leathered Mast Hoop. Bowsprit traveller (Bowsprit Ring), Cranse Irons, Goosenecks, Shackles etc.